Pan Am 103 parts still visible in Lincolnshire. Surprising, but a poignant reminder of this tragedy. Is he being paid to keep it or, more likely, did Mr. Windley win the contract to scrap the stuff and just pile it up instead? For the reason of the tragedy alone the stuff should be smelted and disappear. If not, it will forever be "discovered" every so often and brought to public attention, thereby reopening old wounds for some and awful memories for many. At risk of sounding sarky, if you read the artisler, it will tell you. I think what surprises me most is that those remains are stored outdoors where any forensic evidence will possibly have deteriorated over time. The Megrahi case has never fully gone away and is presently under review by the Scottish Criminal Cases Review Commission. I know a lot of testing will have been done at the time of the bombing but more might yet need to be done depending on the outcome of that review. Diverting from the main topic (apologies) what are those 3 helios stored behind that building ? I was tempted to think Whirlwind or Wessex but I'm not so sure. Too close to home for me, I was walking up to my resettlement training at home when it went in, a minute earlier and I would have been wearing it, I still remember the haunting sound of a lone siren in the near distance on that night as the first vehicle from Carlisle responded followed by the cachopony as all of the other emergency service vehicles responded and headed north. Of trying to talk sense into people wanting to go see, and then as I was walked home seeing the first Chinook responder flying over, I having came off Chinooks a few years before was duly impressed that they had got the crews in, the kit together, generated a cab and got her up the length of the UK in a scant few hours. People I know were respondents that night, both military and civil, and the stories they told me made my decision to stop the stupid attempting to travel up there all the more worthwhile, I remember watching the seakings and Chinook carry out their searches, but a few short miles from my home. Tragic, utterly tragic and such a waste of innocent lives. I was on the command staff at Bentwaters/Woodbridge. When I saw the news report I called the command post (now a feature of the Bentwaters Cold War Museum) and asked the on duty controller to let me know if the 67th ARRS HH-53s were called to service. Last edited by Nige; 6th December 2018, 09:45. 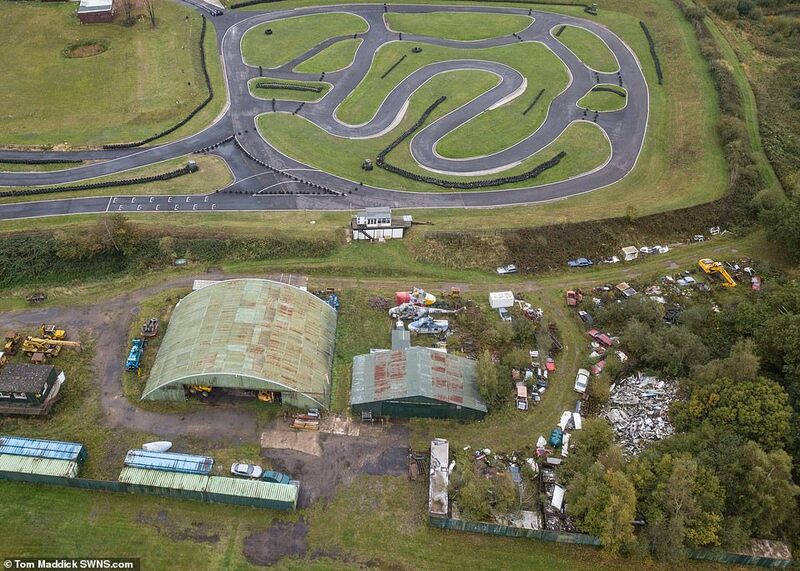 Some swine was selling parts on ebay a few years ago, having nicked them from this compound. Was this an airfield at some point? two hangars & a control tower..
A perceptive question ZR! A close neighbour is the Battle of Britain Memorial Flight at Coningsby. The 'control tower' is probably more related to the track activities behind the scrapyard, perhaps a go-kart track or driving instructors course. I was thinking of the building far left by the yellow crane, not the white building by the track... but looking again with my good glasses on I'm not so sure...However, that 2400ft long grass strip (visible on Google Earth, but the bottom of this pic) immediately to the North does look like a runway. The story on the Pan Am bits is a re told item in the press from 2007. Roger Windley let me look round the aircraft there about 30 years ago (before the Lockerbie bombing). I don't recall any of the aircraft there at the time, other than the wreck of Luton Minor G-BDJG which I had last seen disappearing into the valley at Biggin Hill five years earlier heading to its crash - I gather the pilot happily was unhurt. ZR, you’re not seeing RAF Woodhall are you? That’s pretty close too. Nope, that's off to the North East. When I was stationed at RAF Coningsby in the late 1970's I was a regular visitor to Roger Windley's scrap yard, as I was building a Triumph based sports car and the yard and helpful and obliging staff provided much of what I needed. Mr Windley had a number of helicopters under covered storage including a small Dutch agricultural type. I seem to remember a small adjacent airstrip. I do remember one of the S.55's appearing at Old Warden once, possibly in the 80's. The Lockerbie tragedy was a horrible event. But now the quiet storage in rural Lincolnshire of (possibly) secondary wreckage has been sensationalized by a cretinous British newspaper for no other purpose than to sell it's rag with "sensational Aerial photographs". May the victims rest in peace, because sadly we will be seeing no truth or justice coming out of Libya for a long time to come, Nor the Daily Wail. Was that one of those tailless tip jet things, Colibri or something? Don't recall seeing one there. I do recall his one of his Whirlwinds turning up at the PFA fly in at Cranfield in the mid-80s. Could the type referenced be a Sud-Ouest S.O.1221 Djinn - one is listed in the current Wrecks & Relics as being at this location? All times are GMT. This page was generated at 02:27.